Use Tolcap Tolerance Analysis to Estimate Quality Costs - and fight false 'cost savings' ! - and fight false 'cost savings' ! This note revisits a paper, ‘A Cost Saving Fallacy’, published in Engineering Designer Sept/Oct 2010 and available on our resources page. The purpose here is to show how Tolcap can help you defend your organisation and the Engineering department’s valuable resources against those business target driven issues, such as re-sourcing components, that you know will be disastrous. The problem is that your engineering good sense is just no answer to that hard fact of a cost saving: the only defence is to put forward a credible estimate of the real costs that should be anticipated. Here is a simple example that probably sounds all too familiar. The example from the paper also shows you how Tolcap takes you through a thought process that addresses design for manufacture: the sort of basic issues you need to think through and act on to get a capable design. The final step in the assembly of our product selling for £100 is to fix a lid on the cast case with eight 4mm self-tapping aluminium alloy screws. It is suggested we save 4p by having the screw holes cast in, instead of having them drilled in a separate operation. 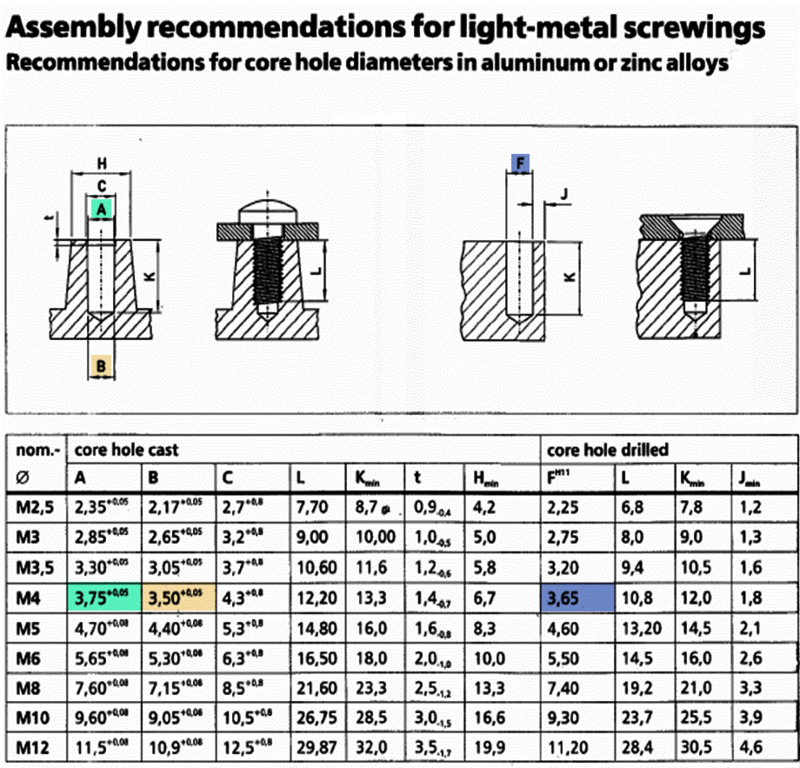 The data sheet (figure 1) for the screws suggests a cast tapered core hole, diameter 3.75 +0.05, -0 mm at the top, 3.5 +0.05, -0 mm at the bottom. For a drilled hole, the specification is a hole diameter 3.65mm with (an ISO) H11 tolerance, which is +0.075, -0 mm. The drilling tolerance ( +0.075, -0 mm ) is slightly more generous, but let’s assume for comparison that tolerance will work whether the hole is cast or drilled. Tolcap works with symmetrical tolerances, so for analysis we convert +0.075, -0 to +/- 0.0375, and as a nicety nudge 3.65 up to 3.7. Tolcap determines drilling the screw holes is a capable process with Cpk = 1.71, equivalent to 0.1 ppm rejections. 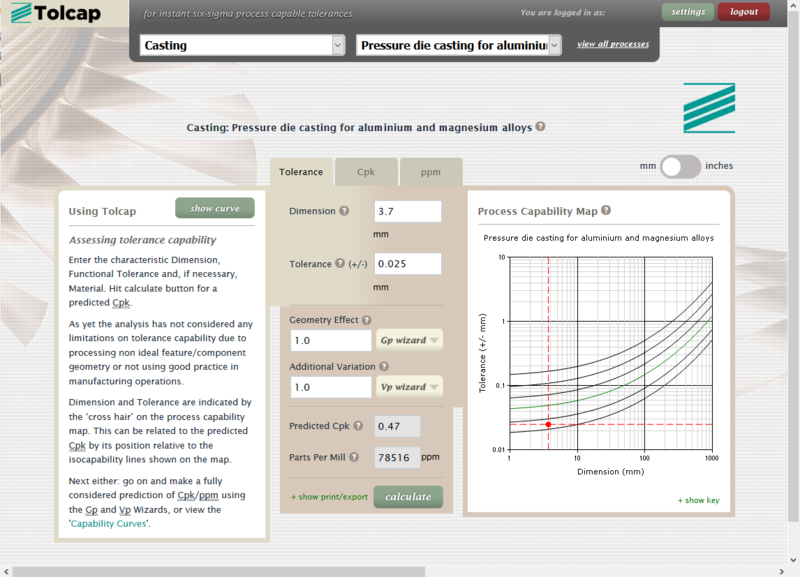 Tolcap predicts casting the screw holes to have a low process capability: Cpk = 0.96, equivalent to 1952 ppm out of tolerance. With 8 screws per unit, that means approximately (1952 x 8 ≈) 15,500 ppm rejected - we anticipate issues with 1.55% of units. If it is, that is a concern, because Cpk drops to 0.47, corresponding to 78500 ppm, and nearly half of the castings will have at least one hole out of tolerance! Let’s keep this in reserve and continue on the basis that the drilled hole tolerance will be ok.
For costs, let’s start by making a few educated assumptions. Tolcap’s Cpk prediction is over the long term, so out of tolerance holes may be too big or too small. For drilling the mean size may drift either way, but a cast hole will get smaller as the tool wears, and the toolmaker should make compensation, so early on the holes will be bigger than nominal. Assume as a start point that 7,000ppm are too big and 8,000pmm too small. If the hole are too big, a screw will work loose and we will assume that 1/100 products will leak and be returned under warranty. If this happens, with all the cost of reshipment and field replacement, the cost is ten times the cost of the product. But if the holes are too small, screws may shear on assembly when they are driven in. Assume this happens on 1% of assemblies, and when it does, this being the last operation, and we lose virtually the whole value of the product. So we save 4p by not drilling: but the question for the organisation is who pays the 7.8p quality cost? Of course, these assumptions will be challenged. How do we justify the 1% of defects becoming failure problems? If the validation programme hasn’t addressed this already, experiments should be designed (or the screw supplier contacted?) to establish the screw shearing torque as the holes get tighter, and temperature cycling / leak tests carried out to check the probability of leakage with loose screws. Then how many out of tolerance holes will be too large, how many too small? We know that as the tool wears, the cast in hole will get smaller. So when the tool is modified to form the hole, it will be necessary to examine initial samples to assess the likelihood of too many holes initially being too big. Later, when screws start jamming, that will indicate the tool needs to be refurbished or replaced. Will these arguments convince management not to go ahead with the ‘cost saving’? I don’t believe it will for one minute - the cost saving saves 4p, but there may be a quality cost of 8p. They will take the bet: BUT you have put forward a rational, numerate case rather than just grumbling that there will be problems; you have lodged due warning of what will be entailed should things go wrong, hence lodged appropriate concern that there is a threat to yours and the organisation’s resources being diverted; you have acted professionally and will maybe be listened to more seriously next time! In summary, we hope this example shows how Tolcap enables you to get a process capability prediction for design options, to go through what that prediction suggests you need to do to ensure you have a design for manufacture, and estimate quality costs on the alternatives.